Touch ID always instead of Master Password on Mac? On iOS, it's possible to always use Touch ID instead of the Master Password, even after restarting and other scenarios. I thought this was not possible on Mac, until I read this article and from its wording, it seems like it's possible to always use Touch ID on Mac as well. However, I'm not sure how to do that. There is no way for me to not select the option in the "Require 1Password" dropdown. And while we're on the subject, I hope 1P will one day allow non-MacBook Pro users to do this as well (with their iPhones near the computer). Hi @sflomenb! Sorry about the confusion from that support article. It isn't currently possible to use Touch ID beyond two weeks. Thanks for the feedback about extending it though. I'll let the team know you asked about it. @Mr. Laser Beam The hope right now is that all MacBooks gain Touch ID in the future. Using an iPhone to unlock 1Password would be nifty for sure, but it's not something we're working on at the moment. Thanks Jacob. Why/how is it possible on iOS but not on Mac? Was it just not implemented on Mac? Or does macOS prevent it somehow? @sflomenb Great question. 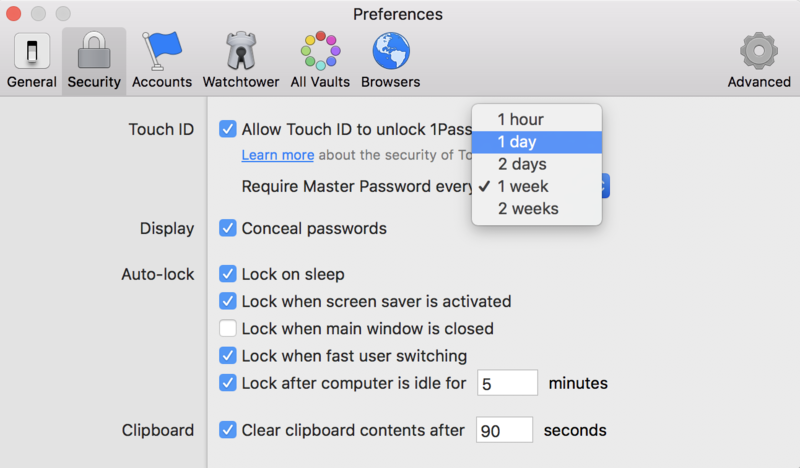 I just had a quick chat with the team about it, and the reason we don't do it in 1Password for Mac is because we don't want folks forgetting their Master Passwords, since they never have to actually use them. We've seen a lot of this with 1Password for iOS and to help people remember their Master Passwords, there's going to be a limit there in the future as well. I know it's not as nice for those of us who do remember them, but a good Master Password is complex, and it should be practiced. @Jacob I don't feel 1Password makes it clear to new users that Touch ID will not be accessible in some situations. I lost scores of usernames, passwords and other critical data due to forgetting my password after not using it for a months. Needless to say, I am not a happy customer and really suffering from being unable to access this crucial data. Welcome to the forum, @scott5535! I'm sorry it's under such unpleasant circumstances. We actually do try to make it clear what Touch ID is and what it is not -- namely, a convenience feature on both iOS and on macOS which, while awesome and much quicker than typing in your Master Password, does come with some additional risks. Remember when Apple changed the Device Unlock (PIN) code from four characters to six? That was introduced right around the same time as Touch ID, and it almost certainly wasn't a coincidence. Touch ID is equivalent to about six characters' worth of password entropy, so it's likely Apple at least partially wanted the device code to be at least as strong as Touch ID. When it comes to Master Passwords, though, we've long advised users to choose a much longer, stronger Master Password than six characters. Your Master Password is what actually secures your data, not your fingerprint, and it cannot be replaced because it is literally what generates the key that decrypts your data. I'm really sorry to hear you've lost access to your 1Password data. If you were using 1Password as a standalone product with local vaults (as opposed to a 1password.com account), then only you know your Master Password. If you didn't write it down somewhere for use in case it was forgotten, then you will have no choice but to start over with a fresh vault. However, it might be worthwhile to try these steps first, to see if you can jog your memory. Let us know how you get on -- and good luck!